The 12th Gwangju Biennale finally raised its curtain Friday under the theme of "Imagined Borders," for which 11 curators put together a dizzying array of some 300 artworks by 165 artists. This year's edition looks at how the world is increasingly enhancing invisible borders beyond geopolitical and physical ones, which affect such issues as immigration and refugees, through multidisciplinary approaches and artistic media. The opening ceremony for the 12th Gwangju Biennale takes place in Gwangju on Sept. 6, 2018. Upholding the initial spirits that brought forth Asia's first biennale in 1995, the art event has expanded into the city's important historic places of the bloody 1980 democratic uprising, including Former Armed Forces' Gwangju Hospital, to install site-specific art pieces. It also created a curatorial archival section, "Return," to look back on the past 23 years of the biennale's history, and re-installed several art pieces, like Cuban artist Kcho's "In Order to Forget" that depicts a boat floating on 2,000 beer bottles. It won the biennale's Grand Jury Prize in 1995. The exhibition is divided into seven sections: Imagined Nations/Modern Utopias, Facing Phantom Borders, The Ends: The Politics of Participation in the Post-Internet Age, Returns, Faultlines; The Art of Survival: Assembly, Sustainability, Shift, and North Korean Art: Paradoxical Realism. Among the topics, the North Korean art exhibition curated by BG Muhn, a professor at Georgetown University and an artist, had been the most highly anticipated exhibit. Fair enough, it is the first time for North Korea's unique art known as Chosunhwa to be displayed in public -- and in full spectrum -- in South Korea. Muhn published a book on Chosunhwa earlier this year after years of research and multiple trips to the North to meet and interview North Korean artists. 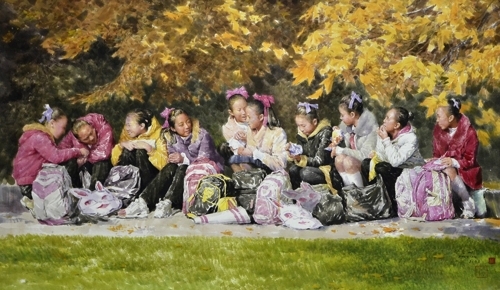 The section exhibits 22 paintings at the height of Chosunhwa, including 15 pieces in possession of the Mansudae Art Studio in Pyongyang, the North's biggest and most prestigious state art studio; three pieces borrowed from individual and institutional collectors in South Korea; and four pieces lent from Yedo Arts Foundation in Washington. "On the Way Home" by North Korean artist Choe Yu-song is displayed in this image provided by the Gwangju Biennale on Sept. 6, 2018. During a press conference in Gwangju on Thursday, the curator emphasized that North Korea is the only country that is still creating "Socialist Realism" art in the world after the Soviet Union collapsed. "It is worth noting that the art has developed a unique expression and characteristics," he said. On the question of "Is North Korean art relevant in today's world?" he said, "There is an assumption that only state-ordered propaganda art exists in the DPRK. It is true that North Korean art is largely propaganda art." DPRK is the initials for North Korea's official name, the Democratic People's Republic of Korea. "But that is not all of what it is," he said. 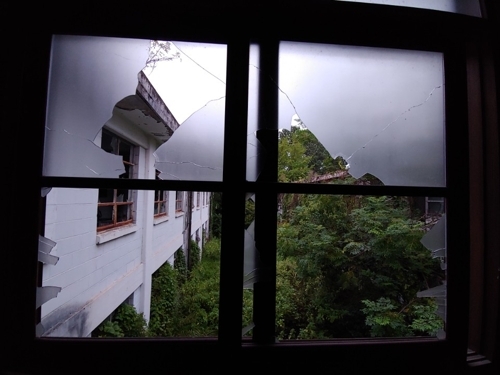 Broken window panes are shown in this photo taken at the Former Armed Forces' Gwangju Hospital on Sept. 6, 2018. For the site-specific commission works, titled "The GB Commission," the biennale invited four artists to explore historic sites in the city where the scars from the brutal crackdown on democratic protesters are still painfully visible. 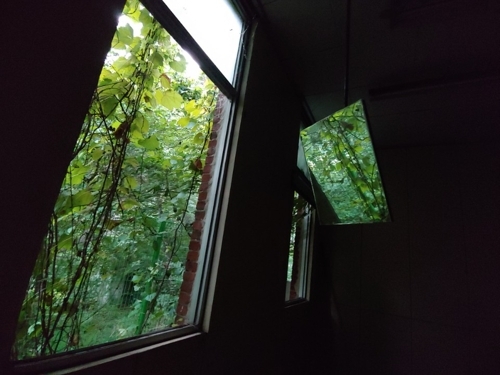 British artist Mike Nelson, who represented Britain at the 2011 Venice Biennale, installed "Mirror reverb (the blinding of a building, a notation for another)" at the church of the Former Armed Forces' Gwangju Hospital, using mirrors, doors and hinges found at the now-deserted building. Kader Attia, a French-born, second-generation Algerian immigrant, explores the trauma of the survivors of the uprising and tries to make it relevant today in "Eternal Now" and "Shifting Borders." The biennale runs through Nov. 11. "Mirror reverb (the blinding of a building, a notation for another)" by British artist Mike Nelson is shown in this photo taken Sept. 6, 2018.